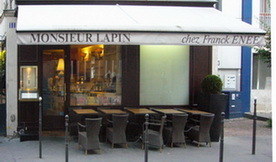 Monsieur Lapin has been around for a quarter century, but it was taken over a couple of years ago by Franck Enée. Barbara has often recommended it, but I never got around to following it up. 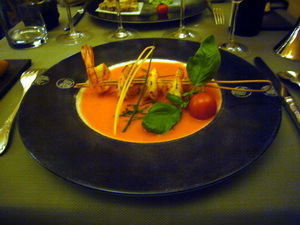 This time, with Mary and me arriving in Paris on a Sunday evening and the restaurant open and within walking distance, we decided to give it a go. 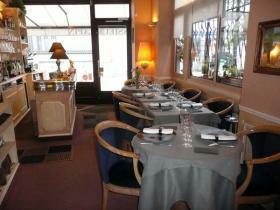 With a name like Mister Rabbit, I expected rather an informal, laid back sort of bistro. 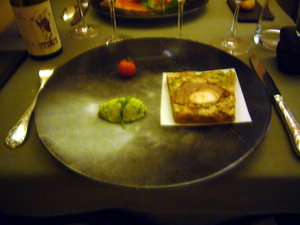 Instead, it proved to be a modestly elegant if rather crowded showplace for a very able and sophisticated chef. 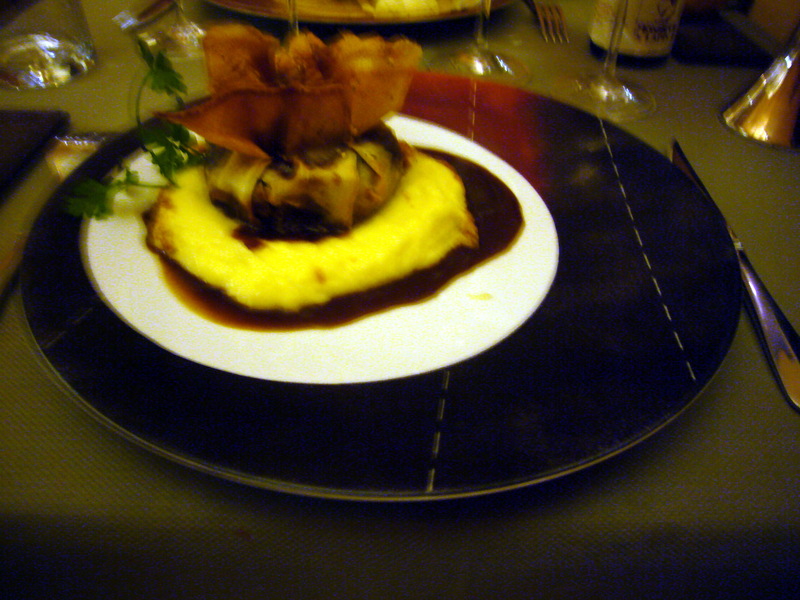 The menus at 35€ and 45€ were above our 30€ benchmark; Mary and I both opted for the former. 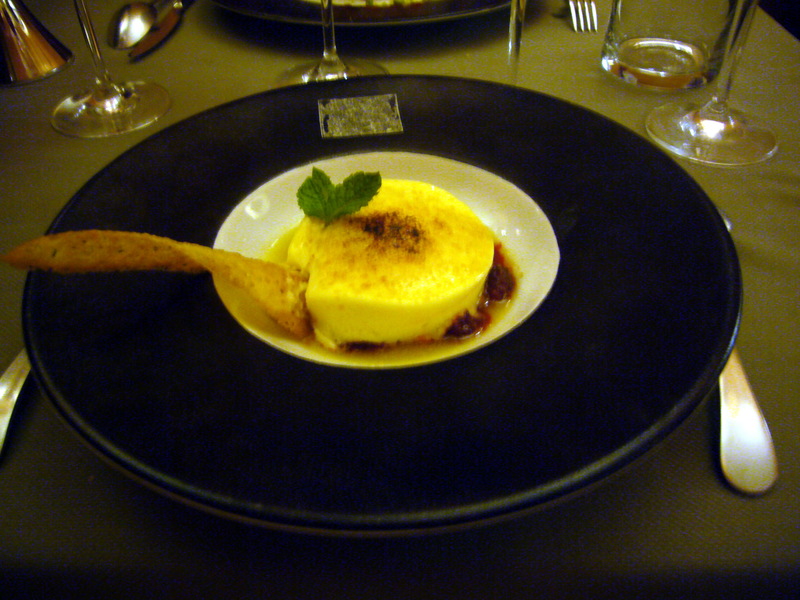 To begin, there was the obligatory amuse bouche on a flat-bottomed ceramic spoon; then first courses that raised our eyebrows and our expectations. My jellied rabbit terrine [left] promised “perfumes of the Garrigue”, which is upmarket shorthand for earthy Mediterranean flavours such as lavender, sage, rosemary and wild thyme. In the event, it was one of the best terrines we had ever tasted, complexly assem bled from several different cuts, including the liver, each perfectly cooked and with its own distinctive flavour and texture. 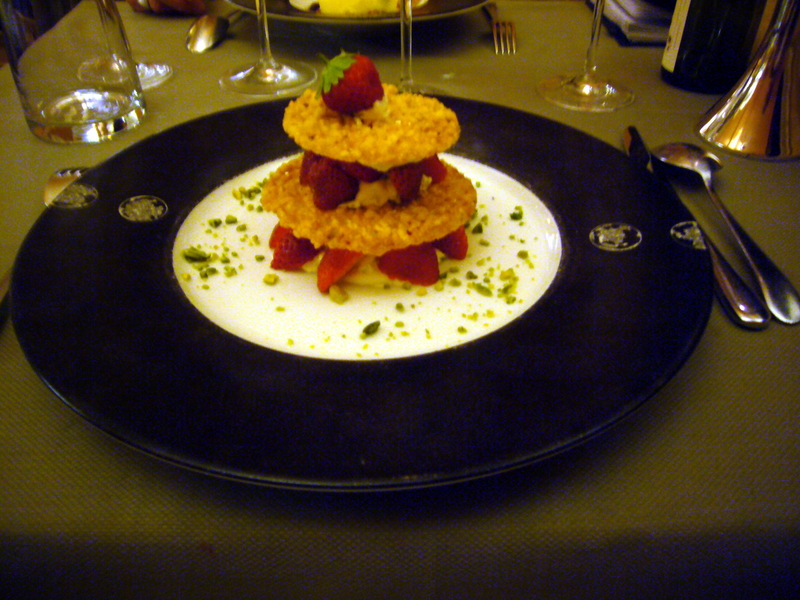 This, we agreed, was what we come to Paris for. 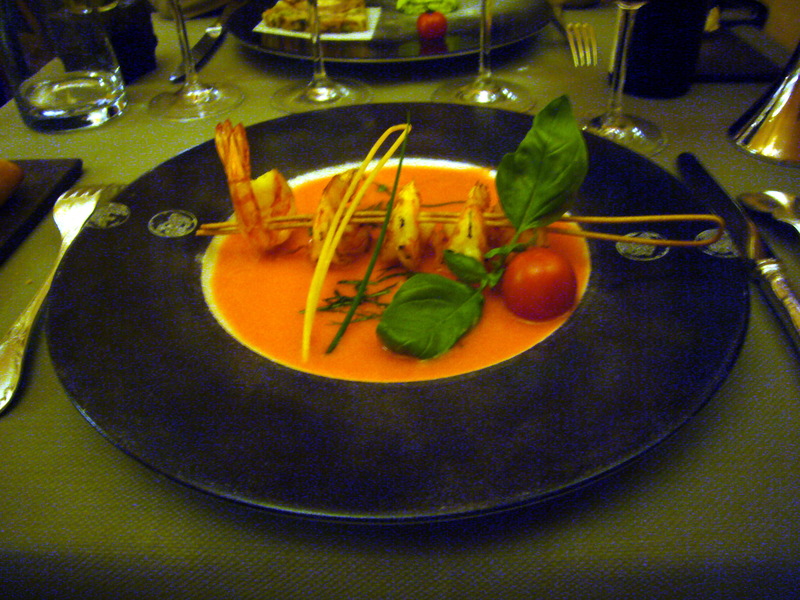 Mary’s starter [right] was shrimp on a raw spaghetti skewer over a delicious tomato and basil coulis – a whole plateful, not just a decorative drizzle. 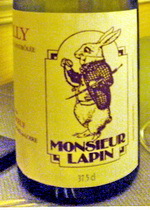 With Mary’s Croustillant de lapin, [left] things really got serious. Inside the crisp pastry case was a generous helping of meat, well cooked, with dried apricot, nuts, mushrooms and tarragon, and served on a generous bed of potato purée. 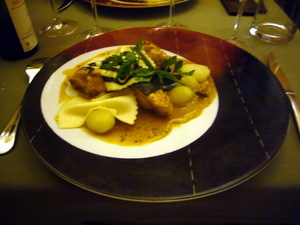 My own classic rabbit in mustard sauce [right] was subtle and delicate rather than peasant-aggressive, served with farfalle (“bow tie”) pasta and perfectly cooked small white onions. It pulled effortlessly off the bones. 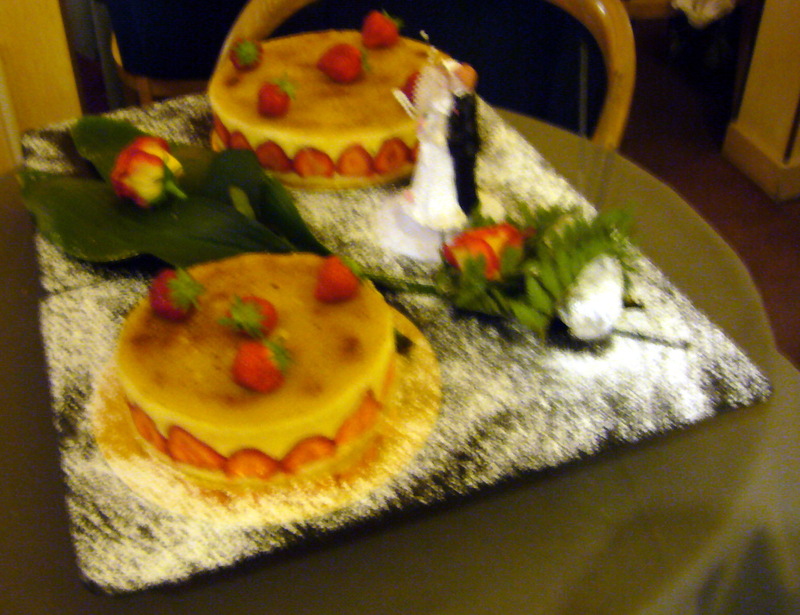 Mary’s dessert was Mille-feuille [left] (actually, they were tiles) layered with strawberries and raspberries. 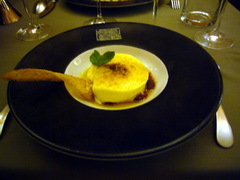 Mine [right] was a Tiramisu with hot stewed rhubarb and strawberries. Both luscious! For a Sunday night, the restaurant was remarkably full. On the way out we saw a partial explanation. Several tables were occupied by a wedding party, and as we left a waiter came out from the kitchen bearing a double cake [below left], very professionally decorated. I snapped a quick picture. It says a great deal about Paris that this notably well-run restaurant keeps ticking over without anyone making a lot of noise about it. It’s in all the guide books, but it never makes the headlines. In London it would be proudly cited as yet another example of why our great city is the best place in the world to eat. A wicked friend suggests where Monsieur Lapin might possibly live: a hutch back of Notre Dame.